I found these awaiting me after my two-week absence. My team knows the way to my heart: not-so-subtle flattery, pink, and sweet things. And yeah, my friends with new, good quality camera phones? They're how I'm going to get around this whole "I dropped my camera and now it's broken, and I have yet to buy a replacement, because it's $170" thing. That, and writing actual text-based entries. Text. Who knew that a blog could have that? 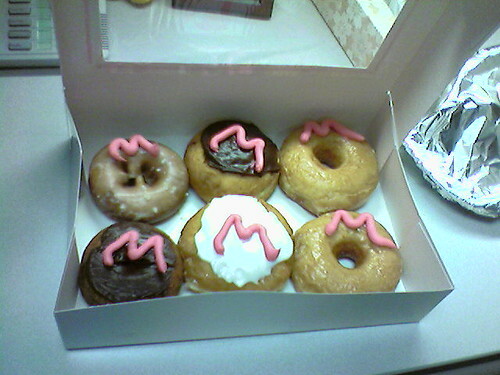 I'm not a big doughnut kind of gal, but the pink icing "M" on those just makes them so irresistable. Its nice to see someone is appreciated in the office! that is so nice!!! you have great co-workers! you must work with a bunch of women. cause i work with a bunch of guys and they hardly pay attention to know that I'd been gone for 2 weeks! I'm jealous. I was out for a week and all I got was a bunch of emails and crap. Ohh you were dearly missed....as I miss you now. Last night a few of us from the wedding were out and someone said.." I miss Marcia...I want her here now!" You have made life long friends. My office seems to celebrate right after I leave. These people are going to buy you a house when you move to Ohio. Awwww. So sweet! But seriously. Who wouldn't miss Marcia??? Those look so yummy! And I feel for you with the camera. Mine broke mid-shot; at least it can go back under warranty, thank God. They loooove you Marcia. They want to kiiiiiss you!